IKOpro High Performance PU Adhesive is high performance moisture cured single part, polyurethane adhesive for bonding rigid insulation boards to a wide variety of substrates. 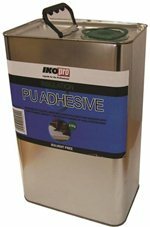 IKOpro High Performance PU Adhesive is cold applied and has been specially developed to allow the safe and rapid bonding of suitable insulation boards. The product is supplied in 6.5Kg tins ready to apply directly from the container. Potrzebna pomoc w znalezieniu właściwego produktu?